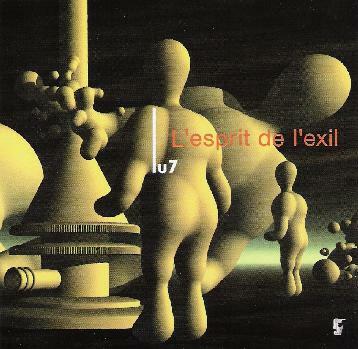 Lu7 - "L'Esprit De L'Exil"
The core of Japanese band Lu7 is the duo of guitarist Tsutomo Kurihara and keyboardist Luna Umegaki, with assistance from numerous guests on drums, percussion, bass, violin, bagpipes and vocals. After a brief intro of flowing dreamy keyboards and bagpipe melody, the band launches into "Canary Creeper", a light progressive rock and jazz fusion tune that characterizes the style of music heard across the albums' ten tracks. Lu7 excel at melodic construction and mixing elements of progressive rock and fusion into a kind of "prog-light", and in many cases "soft jazz", blend that is enjoyable and sounds great due to the outstanding production. However, the music doesn't do much to challenge the listener, offering little in the way of compositional development, the result being that much of the music sounds very much the same. Kurihara has a distinct Holdsworth guitar sound, and while he only rarely lets loose, it's clear that he has the ability to do so. He lets rip with short fiery phrases every once in a while, but that's about it. There were a couple standout tracks that caught my attention. "Secret Recipe", though one of the shortest tracks of the set, is also one of the most interesting and thematically varied. This one really perked me up. Ditto for "Danse Rituelle Du Feu", one of the more energetic tracks on the album. Overall this was a bit too fluffy for my tastes. But there are enough hints throughout the album to conclude that these folks could do something a lot more exciting if they wanted to. For more information you can visit the Lu7 web site at: http://www.crysta.jp/lu7.